Punica granatum is a large shrub or small tree, oval to rounded in habit, growing 12 to 20 feet tall, lesser spread. Foliage is late to emerge, dark green and lustrous, remains late into the fall. Showy flowers are 1 inch or more across, similar shape to carnations, bloom in the summer. Various shades, including variegated types, are available depending on the cultivars. 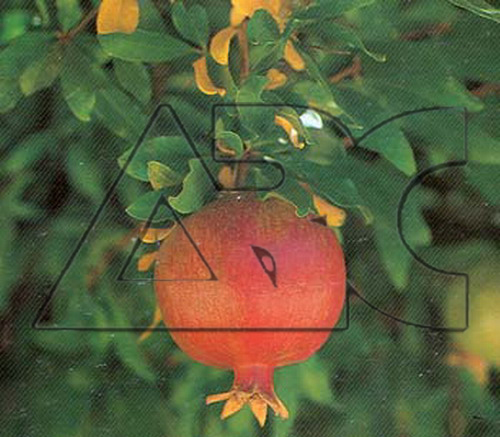 The fruit is the pomegranate, ripening in fall, yellow 3 inch berry with a thick leathery coat. Inside is the brilliant red pulpy fruit.